The New York and New England Railroad was a major railroad connecting southern New York State with Hartford, Connecticut, Providence, Rhode Island, and Boston, Massachusetts. It operated under that name from 1873 to 1893. Prior to 1873 it was known as the Boston, Hartford and Erie Railroad, which had been formed by several smaller railroads dating back to 1846. After bankruptcy in 1893, the New York and New England Railroad was reorganized and became known as the New England Railroad before its 1898 lease to the competing New York, New Haven and Hartford Railroad. Today, most of the original New York and New England lines have been abandoned; however a portion in Massachusetts is now part of the MBTA's Franklin Line providing commuter rail service to South Station in Boston. The Connecticut Southern Railroad operates freight service on a small portion of the former NY&NE line near East Hartford and Manchester, Connecticut. Other portions in Connecticut and Rhode Island have been converted to rail trails. The corridor from Providence, Rhode Island west into New York was originally chartered as three companies. The Providence and Plainfield Railroad, chartered in June 1846, would run from Providence to the Rhode Island/Connecticut state line. The Hartford and Providence Railroad, incorporated in May 1847, would continue west to Hartford, Connecticut, and the New York and Hartford Railroad, chartered and incorporated in May 1845, would continue to the New York and Harlem Railroad at Brewster, New York. In 1849, the two Connecticut companies merged to form the Hartford, Providence and Fishkill Railroad, with a modified charter to continue past Brewster to Fishkill, New York on the Hudson River, and in 1851 the Rhode Island company was merged into it. Later that year the first section opened, from Hartford east to Willimantic. Extensions opened east to Providence in 1854 and west to Waterbury in 1855. The HP&F went bankrupt on January 1, 1858, and was run by the trustees until 1863, when it was leased by the newly formed Boston, Hartford and Erie Railroad. At the Boston end, the earliest predecessor was the Norfolk County Railroad, chartered April 24, 1847. The line from the Boston and Providence Railroad's branch at Dedham, Massachusetts southwest to Walpole opened on April 23, 1849, and an extension to the Providence and Worcester Railroad in Blackstone opened May 16. The company went bankrupt soon after. The short Medway Branch Railroad was leased in 1851, opening December 29, 1852. On May 1, 1849 the Southbridge and Blackstone Railroad was incorporated to extend the line west from Blackstone to Southbridge. On its way to Douglas, this railroad passed through Ironstone, where there was a factory that made Kentucky Blue Jeans, and a nearby iron forge. The Midland Railroad was incorporated May 2, 1850 to build a new entrance to Boston, merging with the existing one south of Dedham. The two companies were consolidated with the Norfolk County Railroad on December 12, 1853 to form the Boston and New York Central Railroad, which had the intent of continuing southwest through Connecticut all the way to New York City. The first section of this extension was incorporated in May 1853 as the East Thompson Railroad, forming the Connecticut portion of the Southbridge and Blackstone. The extension from Blackstone southwest to Mechanicsville, Connecticut on the Norwich and Worcester Railroad was completed in 1853. In January 1855 the new main line to Boston was opened, but was closed six months later until December 1856 because of an injunction due to the danger of the numerous grade crossings. The new line ran to a terminal at the foot of Summer Street in downtown Boston via South Boston. The full line was first operated as one on June 1, 1855, but again failed quickly. On August 6 operations were restarted on only the original Dedham-Blackstone line, operated by the Boston and Providence Railroad as a branch. On March 2, 1857 the trustees took repossession, ending the operation by the B&P. The East Thompson Railroad leased the line, reopening it again in full for about a year before another failure. At that time, all but the original Dedham-Blackstone line and Medway Branch were closed until 1867. The closed lines were sold in November 1858 to the Midland Railroad, but were not operated due to bad condition. The Midland Land Damage Company tried again in 1862, changing its name to the Southern Midland Railroad in 1863 without success. In May 1863, the Boston, Hartford and Erie Railroad was chartered to take over operations of the failed lines and continue the line west to Fishkill, New York, with a car float from there to the Erie Railroad at Newburgh. It quickly leased the Hartford, Providence and Fishkill Railroad from its trustees, giving it a line from Providence west to Waterbury. In September of that year it acquired the former Boston and New York Central Railroad, but did not operate it yet; the old Norfolk County Railroad continued operations by its trustees. In the meantime, the New York and Boston Railroad had built a line from Brookline, Massachusetts (outside Boston) southwest to Woonsocket, Rhode Island, crossing the Norfolk County Railroad in Blackstone. On January 4, 1865 the BH&E absorbed that company, making its Woonsocket Division. On December 13 of the same year, various Erie Railway men were elected to the BH&E board, placing it under partial control of the Erie. On February 11, 1867 the BH&E leased the Norfolk County Railroad, finally reopening the full line from Mechanicsville to Boston. That same year, the branch to Southbridge (part of the original Southbridge and Blackstone charter) opened. The Norwich and Worcester Railroad was leased in 1869, finally giving it a route to Boston, using the N&W from the Providence line at Plainfield north to the old Norfolk County Railroad at Mechanicsville. In August 1872 a direct connection from Willimantic on the line to Providence northeast to Mechanicsville opened, completing the direct line to Boston. By 1869 the BH&E leased the Dutchess and Columbia Railroad, which was building a line roughly southwest-northeast in Dutchess County, New York. The BH&E planned to build west to the D&C at the future Hopewell Junction, but was not able to complete the line and lost the lease in 1870. On September 9, 1872 the Long Island Rail Road's Boston Express began operations, using the BH&E from Norwich (at the south end of the N&W) to Boston. This was later replaced around 1891 with the Long Island and Eastern States Express, using the Danbury and Norwalk Railroad from Wilson Point to the BH&E (then the NY&NE) at Hawleyville (east of Danbury). The New Haven, Middletown and Willimantic Railroad was leased in 1873, giving a line to New Haven. Later that year, the BH&E went bankrupt and was reorganized April 17 as the New York and New England Railroad; the N&W lease was kept but the NHM&W lease was forfeited (prior to its opening August 12), becoming part of the New York, New Haven and Hartford Railroad system in 1879. Note: Various sources note the Boston Hartford & Erie as failing and falling into receivership in 1870, yet it was during the Panic of 1873 that 89 of the country's 364 railroads went bankrupt. The New York and New England Railroad Company was chartered by special act of the Massachusetts legislature on April 17, 1873. Such was the mess of the Boston Hartford & Erie's mortgages and land titles that the NY&NE did not enter into possession of any of the BH&E "system" until sometime in 1875. Alvin F. Harlow in Steelways of New England states that the NY&NE did not get possession of the Hartford Providence & Fishkill line until 1877. Through its entire existence (1873–1895) the NY&NE was always bedeviled by uncertainty in its land titles. Symptomatic of this: the $20 million common stock of the NY&NE originated as the $20,000,000 principal amount of the "Berdell Bonds"; the chartering legislation said the NY&NE was to "succeed to the rights of the Berdell Bondholders". There was a 10% assessment levied on the Berdell Bondholders as part of the chartering legislation, which also appropriated the necessary monies for the state to pay its assessment on its $3,000,000 of Berdell Bonds. For some reason $1000 of Berdell bonds were never issued so for years the NY&NE had $19,999,000 of common stock outstanding. Through all this the receivers of the BH&E and the later management of the NY&NE continued to hold on to the BH&E's Norwich & Worcester lease which was a major part, if not the principal prop to the entire system's existence. The N&W and its related Norwich Line steamers (passenger and freight) made money, enough that the NY&NE could afford to pay 8% (reduced from 10% by negotiation ca. 1885) on the N&W's capital stock. In 1881 the extension from Waterbury west to Hopewell Junction on the Newburgh, Dutchess and Connecticut Railroad opened. Along with trackage rights over the ND&C southwest to Beacon, and a short line built by the NY&NE to the Hudson River at Beacon, this completed the main lines from Boston and Providence to the Hudson River, where a train ferry took cars to the New York, Lake Erie and Western Railroad's Newburg Branch at Newburgh. Part of the line in New York was built along the never-used grade from the failed Putnam and Dutchess Railroad. Also in 1881 the New York, Westchester and Putnam Railway was completed, running north and east from New York City to the NY&NE at Brewster. This company had been previously involved with the BH&E in building a through line between New York and Boston, even being called the New York and Boston Railroad at first, and with its opening such a through line was formed. For some time such a traffic arrangement was made, lasting through the NYW&P's absorption into the New York Central Railroad in 1894. 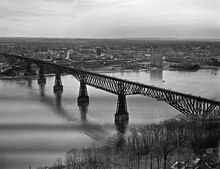 The Poughkeepsie Bridge opened in 1888, providing a fixed crossing of the Hudson River at Poughkeepsie, north of the NY&NE car float at Beacon. The Central New England and Western Railroad, which owned the bridge, chartered the Dutchess County Railroad in 1890 and completed it in 1892, providing a branch from the bridge to the NY&NE at Hopewell Junction. There was a December 31, 1883/January 1, 1884 receivership that got referred to at the time as the "Midnight Receivership" which featured the NY&NE officers trying to find a federal judge to issue a receivership order before the end of the year. This receivership was over by 1886. Cyrus W. Field had become a major figure behind the NY&NE by 1886 but after the state of Massachusetts refused to sell him the $3 million in stock it held (instead disposing of the shares to a rival group because of concern about Field's close association with Jay Gould) Field sold his holdings in the NY&NE. 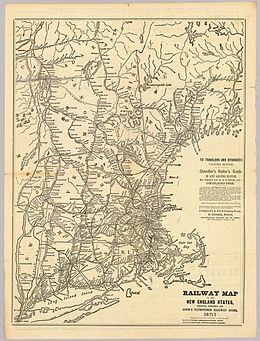 The Massachusetts sale of NY&NE stock was part of a deliberate policy on the part of Massachusetts to get out of owning railroads; the sale of the Hoosac Tunnel line to the Fitchburg in 1887 was also done under this policy, a declared policy of Massachusetts Governor Andrew. The new NY&NE President in 1887 was Jabez A. Bostwick, a Standard Oil partner of John D. Rockefeller. Rockefeller's brother William sat on the board of the New Haven. With Rockefeller lieutenants in both camps one wonders whether the NY&NE-NYNH&H "rivalry" may have been a Standard Oil "Divide & Conquer" policy to get low rates and other benefits out of both roads who together controlled nearly all rail business in New England south of the Boston & Albany. The final bankruptcy of the NY&NE happened on December 27, 1893 and the company was reorganized on August 26, 1895 as the New England Railroad; Stuart Daggett in Railroad Reorganization states the 1895 NY&NE reorganization featured a hefty 20% assessment on NY&NE common. The New York, New Haven and Hartford Railroad leased the company for 99 years from July 1, 1898 at 3% on the preferred (normal dividend) and common stock. The New England Railroad was merged into the New Haven in 1908. Many sources state that most of the NE stock had early on been acquired by the New Haven, probably bought in 1895 when NY&NE stockholders who did not want to forfeit their shares for non-assessment dumped their shares on the market. Baker in Formation of the New England Rail Systems claims there was a mini-Northern Pacific type corner in 1894 in NY&NE common when parties "Friendly" to the Boston & Albany tried to buy controlling influence in the NY&NE and the New Haven had to buy a large position in NY&NE common. Both parties apparently wound up together buying more NY&NE common than actually existed; worse, the New Haven had had to pay high prices for near worthless shares. Over the N.Y. & N.E. Until 1960 the line served as the basis for run-through trains from New York to Bangor, Maine, via the Norwich and Worcester line. As time passed and sections were abandoned, the former NY&NE main lines became minor branches. In addition to the two main lines to Boston and Providence, splitting at Willimantic, numerous branches and auxiliary lines existed. The original Boston line ended at Dedham with a connection to the Boston and Providence Railroad. In 1883 what had become a branch to Dedham was abandoned. Prior to that, a new branch just to the east had been built in 1881, and was supplemented in 1890 by a connection to the south. The Medway Branch Railroad from the main line at Norfolk west to Medway was incorporated in 1849 and opened in 1852, being immediately leased to the Norfolk County Railroad. It closed in 1864, two years after the New York and Boston Railroad reached Medway. The Rhode Island and Massachusetts Railroad was chartered in 1875 and opened in 1877, connecting the main Boston line at Franklin to the Providence and Worcester Railroad at Valley Falls. The New York and New England Railroad leased it in 1887. The Milford and Woonsocket Railroad was incorporated in 1855 and opened a line from Milford to Bellingham in 1868. It was leased by the Providence and Worcester Railroad until 1883. The Hopkinton Railway was organized in 1870 and opened in 1872, running from Milford north via Hopkinton to the Boston and Worcester Railroad at Ashland. The Providence and Worcester leased it until 1885. In 1884 the Milford and Woonsocket bought the Hopkinton, and the two ran as one. The Milford, Franklin and Providence Railroad was organized in 1868 and opened in 1883, extending the line southeast from Milford to Franklin. On April 1, 1897 the New England Railroad leased all three companies. The line eventually running from Brookline, Massachusetts to Harrisville, Rhode Island was originally built as a competitor to the NY&NE's Boston line. The first section opened in 1852 as part of the Charles River Railroad. It reached Woonsocket, Rhode Island in 1863, and in 1891 the Woonsocket and Pascoag Railroad opened, continuing the line to the Providence and Springfield Railroad at Harrisville. In 1873 the NY&NE obtained the line to Woonsocket via a merger; on April 1, 1896 the New England Railroad leased the continuation past Woonsocket. The Providence and Springfield Railroad was chartered in 1853 and opened in 1873 from Providence, Rhode Island northwest to Pascoag. An extension to Douglas Junction on the NY&NE main line in Massachusetts opened in 1893, and the New England Railroad leased the line on July 1, 1896. The Southbridge Branch from East Thompson, Connecticut to Southbridge, Massachusetts was part of the original charter for the Southbridge and Blackstone Railroad, and opened in 1867, after it had been consolidated. The Pawtuxet Valley Railroad was organized in 1872 and opened and leased to the Hartford, Providence and Fishkill Railroad in 1874, running from the main line at River Point to Hope. The New York, Providence and Boston Railroad leased it in 1884 as a continuation of their Pontiac Branch Railroad. 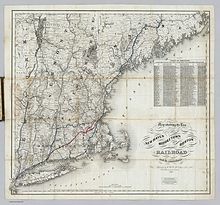 The Norwich and Worcester Railroad was an 1837 consolidation of the Boston, Norwich and New London Railroad Company of Connecticut and the Worcester and Norwich Railroad Company of Massachusetts when both state legislatures passed acts allowing the merger. Neither of these companies had built any railroad but the new one proceeded to build one from Norwich, Connecticut (later New London) north to Worcester, Massachusetts, including the Taft Tunnel at Lisbon, CT. The Boston, Hartford and Erie Railroad leased it in 1869, and the lease continued through the reorganizations. Connections were provided with the Providence line at Plainfield and the Boston line between Putnam and Mechanicsville. In 1886 the New England Railroad company renewed the lease. that it acquired from the Boston, Hartford, and Erie. The New Haven, Middletown and Willimantic Railroad opened and was leased to the Boston, Hartford and Erie Railroad in 1873. The BH&E went bankrupt later that year, as did the NHM&W in 1875. The NHM&W became part of the New York, New Haven and Hartford Railroad in 1879. The Rockville Railroad was incorporated in 1857 and opened and leased to the Hartford, Providence and Fishkill Railroad in 1863. It was a short branch from the main line at Vernon north and east to Rockville. The South Manchester Railroad was chartered in 1866 and opened and leased to the Hartford, Providence and Fishkill Railroad in 1869. It was a short branch from the main line at Manchester south to South Manchester. The Connecticut Central Railroad was chartered in 1871, and its continuation in Massachusetts, the Springfield and New London Railroad, in 1874, to build a line from East Hartford to Springfield, with a branch to the Rockville Railroad at Westway. It opened in 1876 and was immediately leased by the Connecticut Valley Railroad, which gave up the lease to the New York and New England Railroad in 1880. The Meriden, Waterbury and Connecticut River Railroad was formed in 1888 as a consolidation of two smaller companies, opening in 1885 and 1888. The New York and New England Railroad leased it in 1892, as a branch from the main line in Waterbury east to Cromwell on the Connecticut River. The company went bankrupt and was reorganized in 1898 as the Middletown, Meriden and Waterbury Railroad, and was immediately leased by the New York, New Haven and Hartford Railroad. Dike Street originally Westminster Street? For the line from Boston to Readville, see Fairmount Line. For the line from Readville to Franklin, see Franklin Line. ^ Beebe, Lucius. "Two Trains to Remember: The New England Limited and the Air Line Limited." (1965, Privately printed). ^ AGREEMENT BETWEEN THE NORWICH & WORCESTER RAILROAD COMPANY AND THE NEW ENGLAND RAILROAD COMPANY IN REGARD TO THE LEASE OF THE NORWICH AND WORCESTER RAILROAD TO THE BOSTON HARTFORD AND ERIE RAILROAD COMPANY, page 173. Wikimedia Commons has media related to New York and New England Railroad. This page was last edited on 14 December 2018, at 02:20 (UTC).